European designs are often more elegant (or complex, depending on how you look at it), but these features add functionality to products. That was evident in trailers announced and displayed at the recent IAA commercial vehicles show in Hannover, Germany. In conjunction with this month’s feature on global influences on trucks, here we offer highlights of trailers shown at IAA. 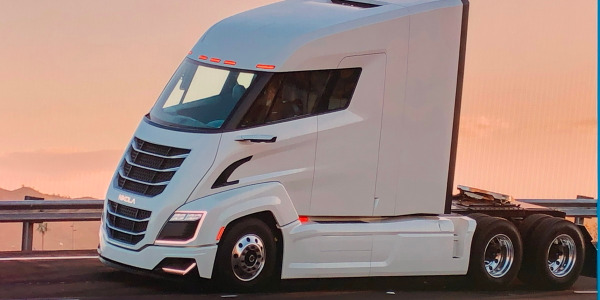 They include a high-cube van with load-enhancing equipment, a “safety” tanker, a hydraulic-motor axle, systems for “kinetic energy recovery” and electric power generation, and an integrated combination vehicle. 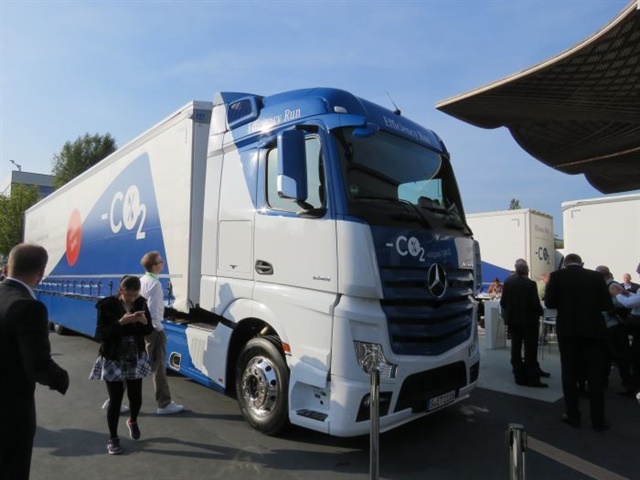 Krone, a major trailer builder in Germany, teamed up with Daimler’s Mercedes-Benz Trucks to produce a combination vehicle that they claim saves up to 20% in fuel compared to standard tractor-trailers now used on the Continent. 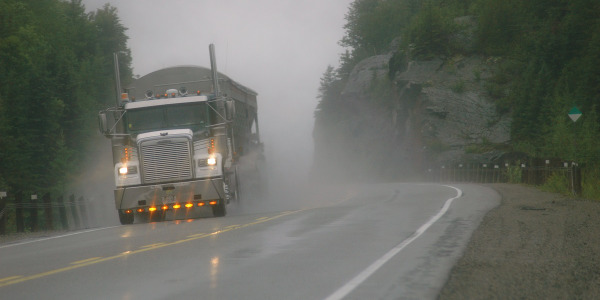 The integrated approach, like the government-sponsored SuperTruck programs in the U.S., proved worthwhile for fuel efficiency and practical cargo transportation. The tractor is an aero-style Mercedes Actros cabover with a high-efficiency powertrain, “anticipatory” cruise control and low-rolling-resistance tires. The tractor is responsible for three-quarters of the fuel savings. The Krone van trailer, called Profi Liner Efficiency, has full-length skirts made of impact-resistant plastic, and a four-part folding “rear wing,” also made of robust plastic. For-hire fleets tested five of the advanced combination vehicles last year and found that they were practical in everyday service, said executives of both companies at an IAA press briefing. Drivers reported that the side skirts were not damaged and did not interfere with forklift loading over the trailer’s edges, and that the rear wing panels were easily folded back with the doors. SDC Trailers in the United Kingdom showed a Kinetic Energy Recovery System, or KERS, at IAA. KERS employs an axle-mounted motor-generator that performs regenerative braking, capturing energy and storing it in a bank of “graphene ultracapacitors.” Upon acceleration, electricity is sent back to the axle motor to help propel the vehicle. Controls are mounted in both trailer and tractor so they communicate and coordinate the powering effort. 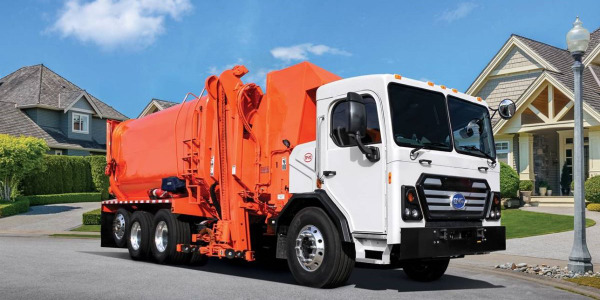 It’s being fleet-tested and fuel savings are up to 25%, SDC claims. 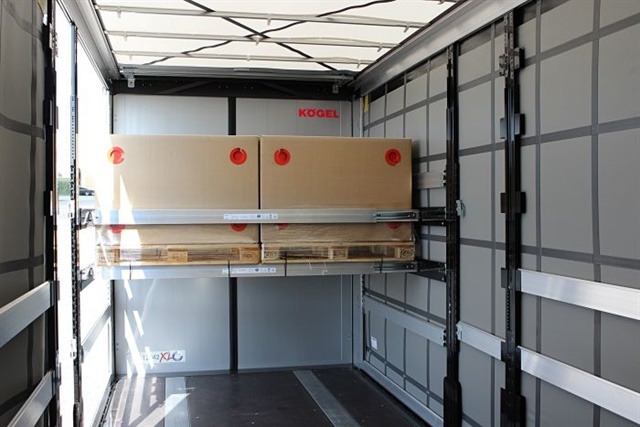 KERS was among the finalists for the Trailer Innovation award at the Hannover show, SDC said. The company called it “a world’s first,” though the American Hyliion electric-axle system was announced in the same time frame (see previous coverage in HDT and www.truckinginfo.com). Hyliion was aware of KERS and noted that it requires a connection to the tractor and equipment in the cab, while Hyliion acts independently. Meanwhile, Bergisch Achsen KG, known as BPW, showed its ePower component, which uses motor-generators at trailer wheel hubs to produce electricity, also during braking. The saved electricity can provide propulsion, or can power a transport refrigeration unit. 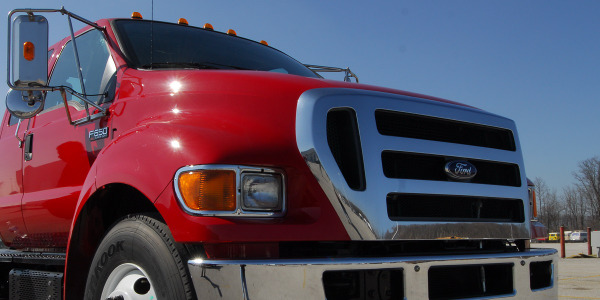 The motors’ weight can be recouped by eliminating a diesel engine in the TRU, the company said. A pair of motors can save 2,500 liters (660 gallons) of fuel a year. A Carrier Transicold carbon dioxide “natural” refrigerant unit has gone to work with Netto Marken-Discount, a major German retailer, following the IAA show. Netto is the first customer in mainland Europe to take delivery of a prototype CO2 unit, mounted on a Rohr temperature-control trailer, and will test it for three years. 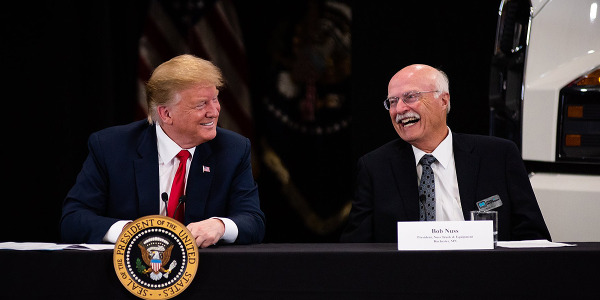 Though regulated as a greenhouse gas, CO2 is a benevolent refrigerant that, if mistakenly released, has minuscule effects on the climate compared to current compounds, Carrier said. The system won the environmental category of the Trailer Innovation Awards 2017, and last year won an award for sustainability at the Solutrans trade fair in France. 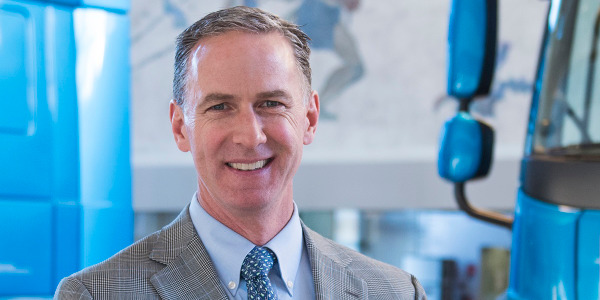 Carrier plans to switch most of its commercial TRUs, including those for the U.S., to CO2. Powered trailer axles are unusual, even in Europe, but SAF-Holland’s SAF-Trak hydraulically driven trailer axle might find acceptance with European operators. The predominate Class 8 configuration in Europe is a single-rear-axle, 4x2 tractor pulling a three-axle trailer. Tractors therefore cost and weigh less than our common 6x4s that pull a tandem-axle trailer. The 4x2 works fine on pavement, especially with a locking differential in its drive axle, but a single drive axle on end-dump rigs sometimes can’t grab enough traction while off road. So such operators often use 4x4 tractors, according to Markus Heuser, Germany-based director of global market communications for SAF-Holland. Of course, a front-driving axle adds weight and cost to the tractor. Thus the company’s SAF Trak. It’s powered by the tractor’s PTO-driven hydraulic wet kit that tips the trailer body. On the trailer, two Poclain hydraulic motors, one at each axle end, turn the wheels to help get the rig moving in slippery conditions. A driver pushes a switch on the dash and compressed oil is sent to the motors to get the traction boost. It works only at low speeds. A hydraulic motor is a 10-cylinder radial, like old aircraft engines. Heuser says the hydraulic tank on the tractor holds a few more gallons of fluid than usual. Because our 6x4 tractors with twin-screw tandems seem to have enough traction for on/off-road work, there are no plans to bring the SAF Trak axle here. 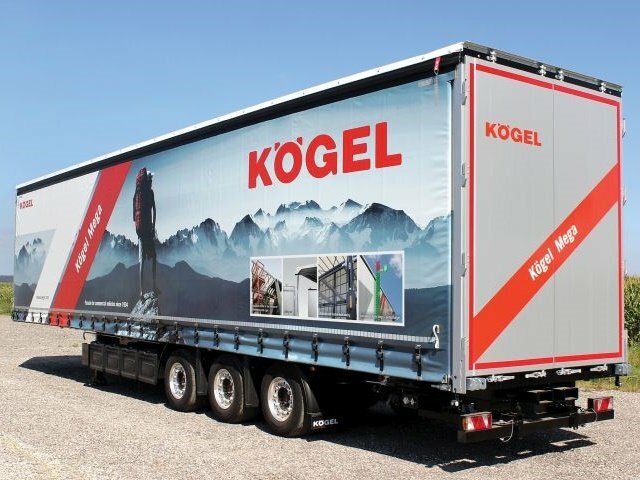 Kögel, a major trailer maker in Germany, showed a high-cube “Mega” model with an internal height of 3 meters (118 inches), and a mechanical/hydraulic lifting roof. Cargo can be wheeled aboard through the rear doors or, with the roof tarpaulin opened, lifted in by a crane. European size regulations limit overall length to 45.75 feet and exterior width to 100.4 inches. In the trailer’s rear is storage for an on-board forklift (which we’d call a pallet jack), as well as a receptacle for securing chains and a storage slot for a counterweight on the front wall. This trailer included optional double-level loading, “using steel C-rails and telescopic aluminum load-securing beams,” a statement said. The displayed Mega trailer’s lead axle is liftable and wheels were aluminum alloy. Its frame was protected from corrosion by “nano ceramic and cathodic dip-paint coating, supplemented with UV painting.” Similar processes are used in the U.S. The Safety Bitumen Tanker from Germany-based Kaessbohrer won a Trailer Innovation award, a biennial honor whose winners are chosen by a panel of European trade journalists in collaboration with the German Association of the Automotive Industry. The tanker’s automated electronic discharge system protects the driver from injuries during the offloading of hot liquid asphalt, called bitumen in Europe. The driver hooks up piping as normal, and stands back as a remote control discharge system turns on valves; he stands up to 6 meters (about 19 feet) away from valves and pipes so he isn’t scalded during any leakage, according to the tanker’s builder. The sequential opening and closing of the valves is automatic. Other features include a protection cover that seals and secures the hose, and when opened functions as a drip pan; a safe-start system that locks the brakes and keeps them applied until hand rails and drip pan are folded up and the protection cover is closed; and a temperature data logger that monitors and records any temperature change inside the tank.